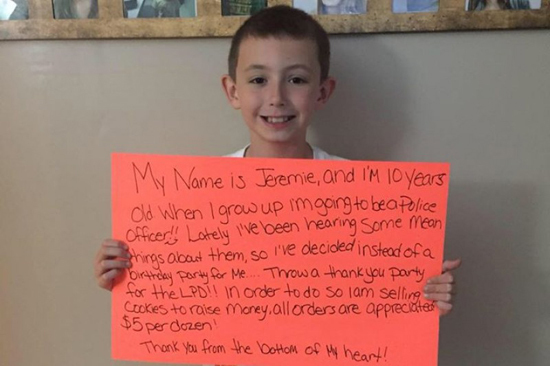 Another kid has skipped his birthday in order to throw a party for demoralized cops. This is one trend that’s catching on, and we love it! 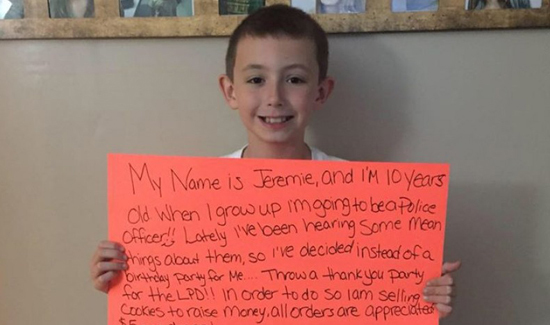 “Los Angeles Police Officer Gary Hall flew across the country this week to be thanked for his sacrifice by a boy who chose a ceremony honoring police over his 11th birthday party. That boy is Jeremie Bordua, a fifth-grader at Lansing’s Mount Hope STEAM School in Michigan. “After all the news coverage and everything, we start to feel like we’re getting kind of beat down,” said Hall, who attended today’s ceremony at Eastern High School’s Don Johnson Fieldhouse with his wife, Cyndi. Ingham County Sheriff Gene Wriggelsworth said this is just what the troops needed.